Special Containment Procedures: Confirmation of SCP-2886's current location is to be maintained at all times. Personnel assigned to SCP-2886 are to maintain path projection charts based on data of SCP-2886's relocations, in order to help identify its next target. If SCP-2886 relocates to a different celestial body, it is to be located as quickly as possible, and its path projection chart updated. Information regarding the anomalous nature of SCP-2886 is to be censored upon discovery, with particular attention paid to the information networks of the world's space agencies and amateur astronomy websites and magazines. Since 1971, knowledge of SCP-2886, but not its anomalous qualities, has been public. All possible efforts are to be made to maintain public belief that SCP-2886 is a non-anomalous planetary feature. Description: SCP-2886 is an ostensibly dormant volcano, approximately ██ km in height. SCP-2886 was originally discovered in the mid 19th century by astronomers as an albedo feature on Triton, Neptune's largest satellite. On occasion, SCP-2886 will disappear from its current planetary body and reappear on another. Since it was discovered on Triton, SCP-2886 has teleported 10 times. Current predictive models indicate [DATA EXPUNGED]. SCP-2886's anomalous nature was realized when it disappeared from Triton and reappeared on Oberon, one of Uranus' satellites, approximately sixteen years after discovery. SCP-2886's effect on the geology of its host planetary body is unknown. Observations have noted that it displaces an enormous amount of planetary material at its arrival point, with most of that debris reappearing elsewhere on the surface. The currently prevailing theory is that it has a splash-like effect on the surface of its host, dispersing debris around itself with no clear pattern once it arrives. For a full list of planetary objects formerly occupied by SCP-2886, please see document SCP-2886-DOC1. 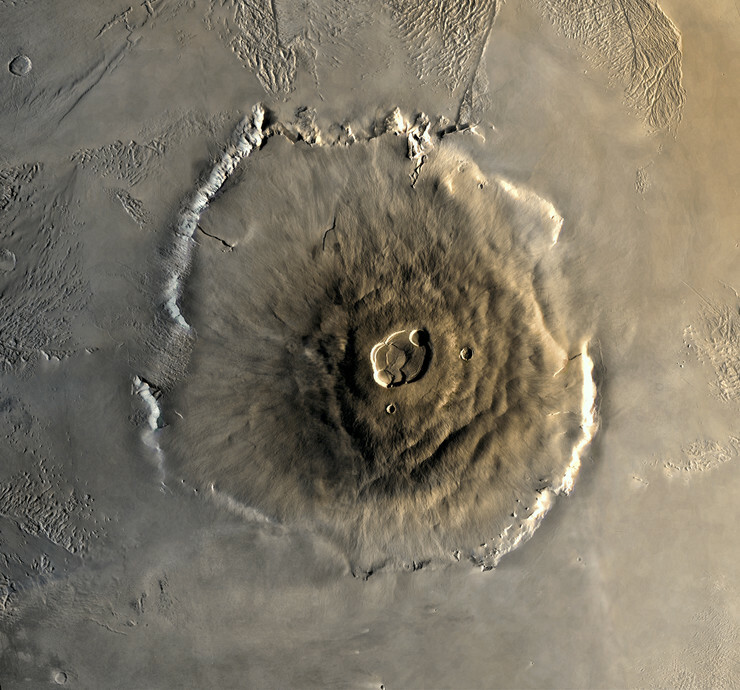 SCP-2886 is currently located on Mars, and is publicly known as Olympus Mons. SCP-2886 has not moved since its public discovery in 1971 by the Mariner 9 unmanned probe. In 1980, a radio signal was broadcast from the surface of Mars, believed to originate from SCP-2886. The signal was too faint to be audible on standard household radios, and as such containment of information was deemed unnecessary. Foundation radio astronomers succeeded in recording the signal. The broadcast was composed entirely of excerpts of sound clips from the Voyager Golden Record, and looped for approximately 3 weeks and 2 days before ceasing. Additional broadcasts similar in content have been intercepted in 1993 and 2011. Due to potential importance to SCP-2886, they have been included in this file. Sections in foreign languages have been translated into English. [spliced excerpts of Jimmy Carter's speech1] We are attempting to survive our time, so that we may live into yours. Vast. 1. Note that this section is comprised of electrical impulses that were designed to be translated into printed text. No audio recording of this speech exists. 2. Section is a recording of morse code.